I announced this first to chess resellers, none of whom took notice. So many of these people are so "busy" and so clueless, and new, they wouldn't know what to do if I visited them personally. 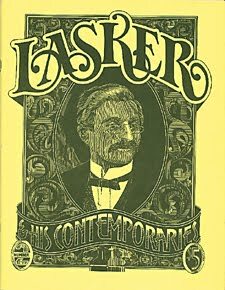 I sometim s wonder if some of these folks have any idea who Lasker was. Something happened yesterday which propelled me into action. The oddity is that 2 weeks ago I ran across the material which I had typeset in the late 80s for L&HC #6. I have been putting this off for years. I had much of the material but no time to put it together or proofread it. Last night, I made the time, and this morning, and this afternoon, and tomorrow, etc. To begin there are three major articles, a long one on Schiffers, the #2 chess player in Russia when Chigorin was around, Lasker on Combinations, and information in detail about his PhD in mathematics. Then there are vignettes such as a position at the 1914 St Petersburg tournament where Tarrasch said Capablanca had a win over Lasker in their drawn game. Lots of bits like this. The magazine will be somewhat in the style of issue #1 of Purdy's Chess Chronicles. The last magazine (#5) was $20 and ran 64 pages and that was a LONG time ago, 1997 I think, which I co-edited with John Hilbert. We even won the Fred Cramer Award for the best new chess magazine (I have no idea how many submissions there were for that category). This one is an issue I planned a long time ago. There were even some article which others wanted published but I couldn't promise them anything. I think one was since published somewhere else. My tough luck. $25.00 + $3 for shipping (in the US) if you act before March 15th. If you get it later, it will be $34.95. That's a $10 savings, worth going to the trouble. If you buy multiple copies, the minimum is 5, and there is a 20% discount. If you want 10 or more, you get a 30% discount. Checks and Paypal are OK too as well as credit cards. In earlier issues, such as 1-4, I sold between 500-1000 copies of each issue to collectors, dealers, and people just like you. The magazine was the same size as #5, but fewer pages. This one will have at least 64, and also be printed. I've got to get back to work on this as the typing part is what is slowing me down as I am not a touch typist, per se. Email announcements will be sent out within the week too. I expect a rush on this and those who contact me right away with payment or authorization on their credit card is on file--will be handled first. Please, no questions (they are nothing but a stall). More information will be put on the Blog and provided in emails I send out as well as enclosed in packages I mail. I also have a few issues of Lasker #2 available at $20 (mint condition, just found them). If you order Lasker #6 in advance WITH #2, the special price is $40 + $4.00 for shipping. Thanks... Here comes Lasker and His Friends, #6.